"The goal of the course is to lay a foundation so that students are prepared for a freshman college-level chemistry course. The hands-on, visual approach to learning that takes place with the games and activities will certainly make it easier for many students to grasp concepts, particularly valence structures." Cathy Duffy, Christian Home Educators' Curriculum Manual: Junior and Senior High. "I love it! Hands-on and easy to use, with clear explanations in language you and your kids will easily understand. After perusing several dull chemistry books and a computer program that almost crashed my computer, I was genuinely relieved to find this course. Friendly Chemistry is designed to provide all that's needed for high school studies and college entrance, and you'll have fun learning it all. Included are many games, some with multiple playing levels to challenge you as you learn." Jean Reed, The Home School Resource Book, 3rd edition. "Friendly Chemistry is the most innovative approach to teaching chemistry that I have had the pleasure of coming across! It bridges the chasm between kitchen chemistry sets and boring high school texts. Best of all, it makes learning fun!" Kathleen Iuzzolino, Homeschool Connection, Inc.
"I am using Friendly Chemistry to teach a group of 20 students in 6th-11th grade. Even though there is a wide range of ages, we partner the younger with the older and they are ALL learning. We love it! It is not your "traditional" text that jumps from topic to topic. This curriculum builds from the first lesson. Each week, they use the skills learned from the previous week with the addition of a new concept. The text provides ample practice problems plus an answer key that shows step-by-step solutions. I have a Masters in Nursing and had two college chemistry classes but never truly understood it. I memorized enough to pass the exams. This was one reason why I wanted our 8th grade children to learn chemistry and the other is that with their previous science curriculum there was no exposure to chemistry. I received my text over the summer to help me prepare for the classes in the fall. Within no time, I totally understood what I had missed out on in my college classes. We all now know the WHY, not just the WHAT, when chemical reactions occur. Even though it has been 25 years since my college days, I want to go back and do it all over again!! "We finished the Friendly Chemistry class a few weeks ago, and it was a raging success. Thank you again and again for such well thought out, wonderfully presented, user-friendly material. I am so grateful for your dedication to making science (and in particular, chemistry) fun for children. In fact, we had such a good time, that I will be teaching it again next year. Word has spread about what a great class it was." Co-op group leader, New Hampshire. "Your curriculum has been a life-saver for us - my daughter is going to be an art major and is not particularly "science-minded"....she was very pleased with the course because it builds up knowledge step-by-step and was not overwhelming. She found the lessons very clearly explained. My homeschooling compliance organization had not heard of it before, until I showed it to them. They were pleased that it satisfied the requirements for a college-prep course. We looked at other curricula, which really seemed too "intense" for our purposes (and EXPENSIVE to boot!). I think that parents should be aware that there are other options out there for their students. I'm pleased to recommend it to others!" Amy T. Greenville, South Carolina. "Friendly Chemistry is real-life chemistry for the rest of us." "A terrific book-and-(multi)game set for beginning chemists. 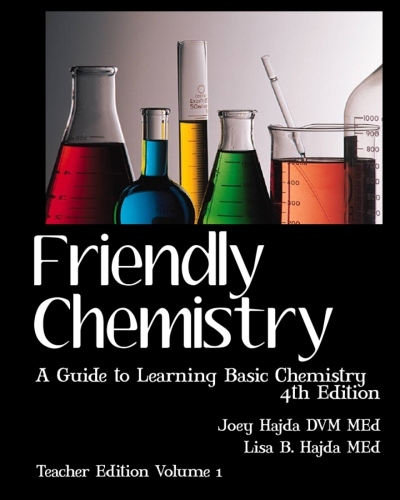 The book, explains the Friendly Chemistry introduction, 'was written to serve as a general chemistry guide to be used by any student, of any age, who is curious about chemistry.' " Rebecca Rupp, Home Education Magazine. "We have finished the entire Friendly Chemistry program and we wanted to let you know how fun and great it was! I have a background in chemistry, but I think it would have been easy to use even if I hadn't. Our 13 year old is very interested in chemistry and we also used a high school textbook to answer some of his more involved questions. However, we didn't find the high school text to be much more detailed than the Friendly Chemistry material! His retention has been excellent; after our Christmas break, he didn't seem to have any trouble diving right back in. The Friendly Chemistry material really helped us all to be able to visualize and REMEMBER the concepts presented. I think anyone who has used Friendly Chemistry will feel the same way--it is a real breakthrough in explaining some very difficult concepts in a very "friendly" way! I can't thank you enough for writing such a great "text." Thank you for a truly great program." Homeschooling Family, Colorado. "We love our Friendly Chemistry. Thank you for this great kit. It truly does make chemistry "friendly." My boys, ages 14 and 12, are enjoying it, and better yet, they are understanding it!" Homeschooling mom, Alberta, Canada. "Yes, she is all done now! We appreciate all the help you willingly gave us this past year. My daughter said that explained things more in-depth and more clearly than the curriculum we tried previously. Focusing on the concepts and less on the formulas was just what she needed. We are glad you wrote this curriculum and will recommend it to others." Parent of high schooler. "We used this and it has been amazing. Even when I had questions and emailed, I got fast replies and great help. I love this chemistry and will use it with my kids coming along." Homeschooling mother.